Another beautiful morning to start off with assignments to carry out from last week’s orders. Storeroom rack planning for customers who need good and friendly advice! 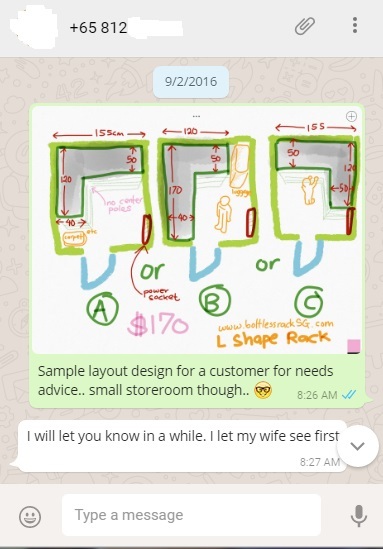 We decided to document down some of our projects for our future customers out there to get a feel of what it’s like to get your own storage rack in your newly built BTO flat / condo. 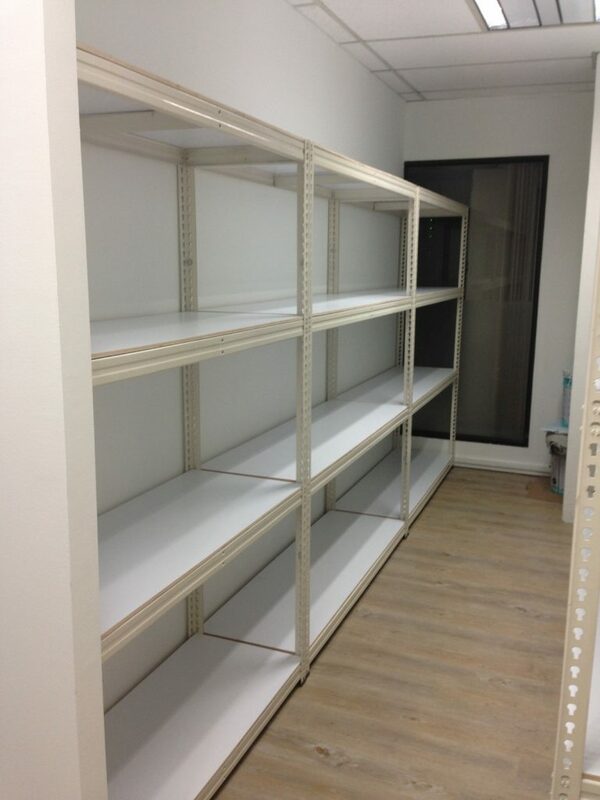 The owner, Mr. K (who wants to remain anonymous) wanted to maximise the space in his storeroom. If its an L shape storage rack, so it shall be! Oh no! Last minute message at night to request for a tight deadline. We did what we can! 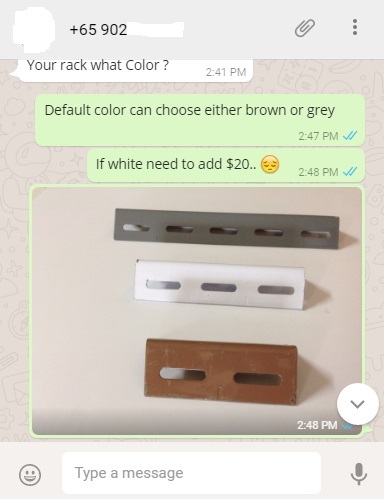 We did ask what colour does he want his rack to be in – dark grey, brown or white? 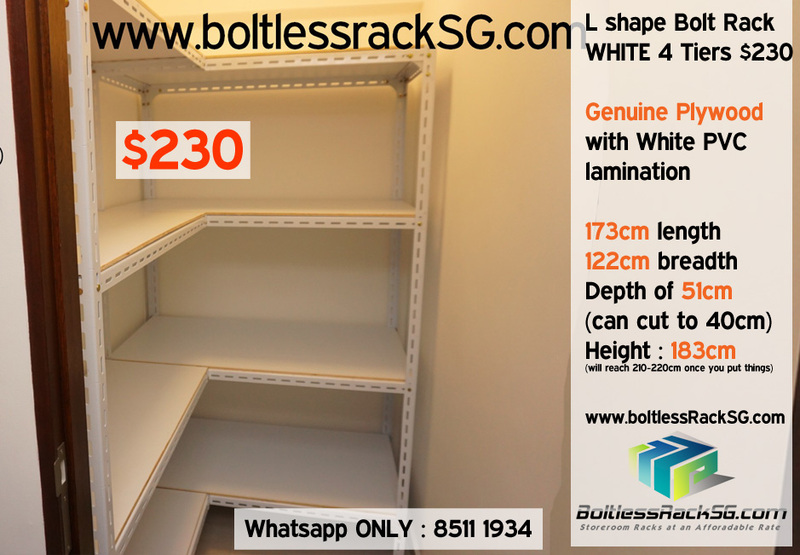 Do take note that White colour is actually an additional coating of the original colours of the steel exterior which is why it is an additional cost of $30. A bubbly Mr. K picked Dark Grey colour and finalised his order with a deposit of $10 over ATM transfer. 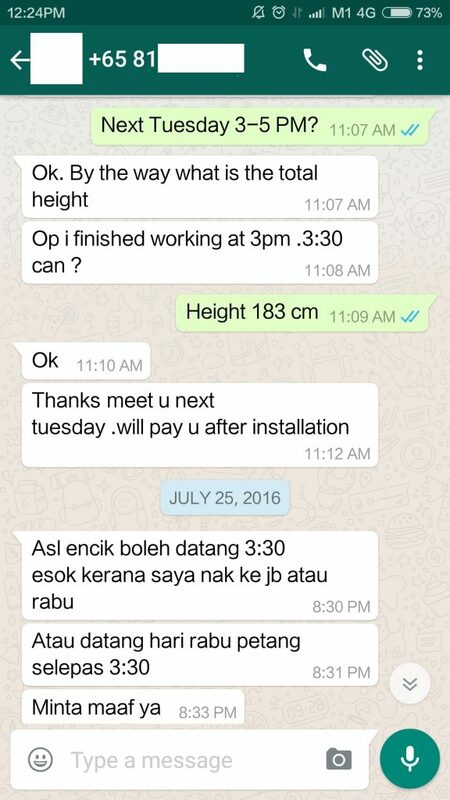 Our handymen wasted no time, reached on site at Punggol Drive and started hustling away. Hustle and bustle getting the rack done in one of our client’s place in his Punggol Drive bomb shelter. Our client Mr. K had already specified that he wants the L shape rack to occupy the right hand side of his bomb shelter. Communications were clear and boy oh boy, it made our job easier. 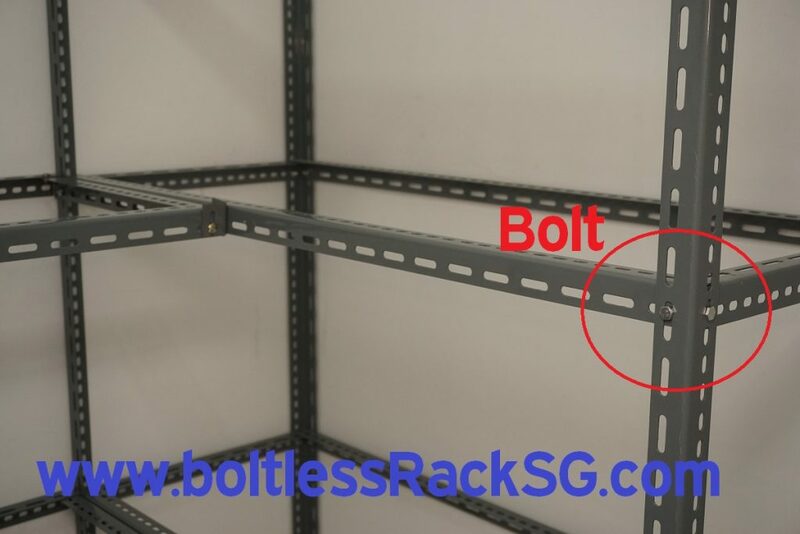 Oh why oh why are we highlighting on BOLT rack as opposed to our website name? Simply because 90% of our orders are for BOLT racks! eventually we listen to customer demands and catered. Now that the entire rack is fixed, time to add in our customised cut plywood for the finishing. Why plywood? Simply for its strength, reliability and odourless feature. Never ever take fibreboard, people! ASK, ASK, ASK! How do we identify if its plywood or fibreboard? Our plywood comes in White PVC laminated top and bottom while fibreboards just come in their wooden brown plank. Unless of course, you want that fibreboard’s smelly musty smell + mould + insects after a few weeks! Then again why do other companies use fibreboards? For the simple rationale of its price – cheaper. Be wary of companies and suppliers who use these cheap type of wood. That’ll probably be the first thing in your checklist when sourcing out for your desired storage rack. 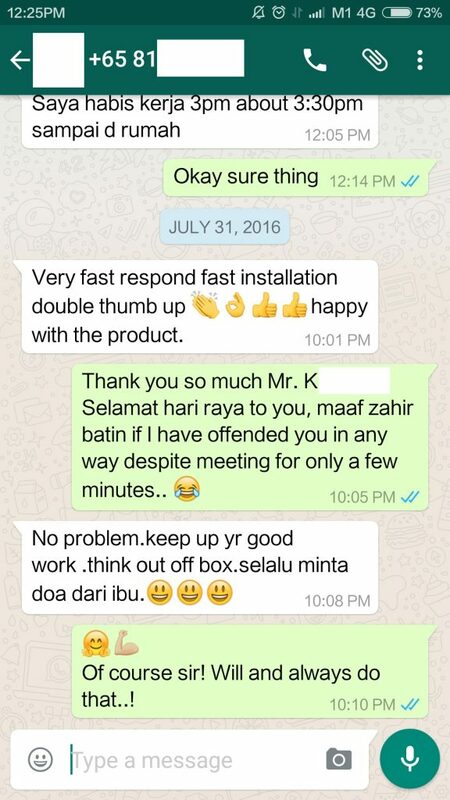 And we thank you too, Mr. K for engaging and trusting us in fixing your desired rack for you! Click here to read more testimonials from our customers and learn of their experiences. Screenshots of messages included! Anyways, here is also another good idea on how to make your store rack more organised and neat – with affordable and really clean looking storage ideas. Till then, hear from you and let’s talk soon! 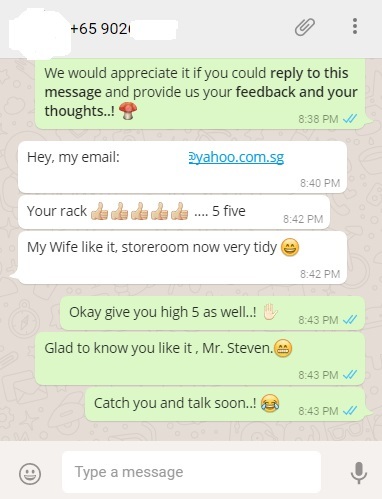 Click the button above to directly contact and Whatsapp our Sales Manager, Ms. Chang. For Grey Bolt Rack L shape, we are able to custom it to 238cm x 117cm for $280. The workmanship and labour cutting will be done at our factory beforehand and when we come to fix, it will all be done within a matter of 15mins. However, it is the traffic that delays us..
Workmanship of labour and cutting are waived and Free. I would like to make some enquiries as we wanted a small rack for our storeroom. What is a typical L shape rack price range? Is it possible to have the installation done after office hours during a week day? 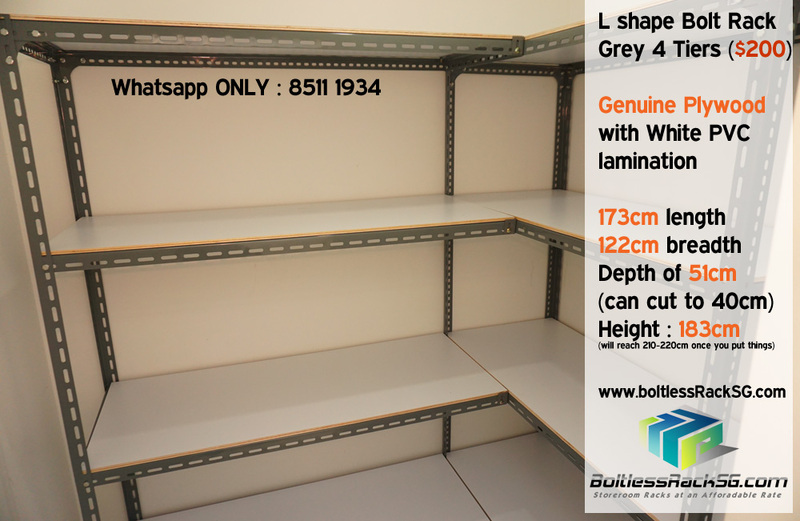 our L shape Grey Bolt rack measurement of 173cm x 122cm , 4 Levels with height 183cm is $200. It is $20 deposit via iBanking /ATM then remaining $180 cash to our men after they are done delivering and installing. Yes it is possible. For areas in the west mostly we do 530pm to 9pm. Is it possible to have the installation done after office hours during a week day or weekend ? including delivery & Installation fee also. For Grey BOLT rack with plywood L shape NO CENTER pole CUSTOM CUT to 1550mm x 1200mm is $200, sir. Do let us know and contact our sales manager! Hear from you soon!